Open a new Business Growth Checking or Business Relationship Checking Account using promo code e-mail to you. You get this code on the landing page linked above. To receive the $300 gift: 1) Open a Business Growth Checking or Business Relationship Checking Account, subject to approval, 2) Make at least one deposit of $500 or more to the account within 15 calendar days of account opening and 3) Maintain an average daily balance of $500 or more for the first 90 days after account opening. All standard account opening procedures apply. This offer is not available to existing Columbia Bank business checking account customers. Fiduciary accounts and nonprofit organizations do not qualify for the offer. Offer is not available to those whose business checking accounts have been closed within 90 days or closed with a negative balance. Limit one $300 gift per qualifying account. Limit one $300 gift per business. After you have completed all the above requirements, we will deposit the gift in your new account in the three months following the 90-day review period. The gift is considered interest and will be reported to the IRS in accordance with applicable law. Accounts overdrawn or closed at the time of the gift fulfillment are not eligible for this offer. Employees of Columbia Bank, its affiliates and subsidiaries are not eligible for this offer. You must present this offer code at the time of account opening to qualify for the gift. Number of days used to determine gift eligibility will be calendar days. Member FDIC. Account must be open at time of bonus posting. Other than that I don’t think there is any early account termination fee. They also have a $200 personal checking bonus worth doing. I imagine you can open both at the same time. This $300 business checking bonus is definitely worth doing, only requires a $500 deposit to trigger the bonus. I guess most people would deposit $2,500 to avoid the monthly fees as well. Either way still a great bonus and we will be adding this to our best business checking account bonuses. Could you add “business” to the title? Yeah, “business” designation would definitely help. 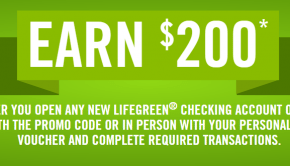 I was initially bummed out when I saw this as I’d just opened up the $200 checking account offer. Luckily this is for the business checking. I guess it’s back to the bank for me. Thanks for the heads up! As usual. This is by far the worst bank all around.. Security, customer service, and product offerings that I have ever had the misfortune of having to deal with. Were you introduced to them because of their banking bonus? DP: Opened a personal and business account. No credit card funding. What does your Chex look like? Sorry for the late reply. I’ve never checked my report, but I’ve opened around 5 accounts in the past 12 months before this one. Bad DP. Would not allow me to open without a registered business. Edit: just called another branch and they said they open accounts for non registered businesses all the time. Now I know what I am doing for lunch break tomorrow. Whoops, sorry for the late reply. I went into the branch and they told me I had a business account that was closed only 2 months ago. It was only then that I realized I had been in that bank before to close an account that I was a signer on for my work. Was going to give it up and I now see the deadline has been extended until the end of October – will head back there in a couple of weeks. Also opened personal and business at the same time. Nothing required for sole proprietorship in Oregon. This bonus, and the Personal Bonus have been extended to 10/31/2018. I put my email in to request the code and the email has the extended expiration in it. William Charles – extended to Nov 30. What does it mean:” we will deposit the gift in your new account in the three months following the 90-day review period.” ? Min closing is 180 days or 90 Days to receive the bonus? Bonus just posted today, almost 90 days to the day after I completed the requirements. So I guess that helps give us an idea of the timing as it relates to that very awkward “After you have completed all the above requirements, we will deposit the gift in your new account in the three months following the 90-day review period.” So I guess they deposited the bonus on the first day of the 3-month window following the 90-day review period after the completion of bonus requirements? lol. Whatever, I got it and that’s all that counts. It’s been 90+ days after completing requirements, but no bonus yet. I got an email after opening the account that it was my “last chance to use my unique [bonus] code”, so maybe the code wasn’t attached to my account. I’ll wait a bit longer and call in to check. Looks like the expiration is now December 31, 2018. Personal account bonus was also posted – bonuses seem to post in bulk every 15 days, corroborating other DPs about this. Echo sentiments from “ap” above. The bankers were very nice and helpful to get my accounts opened. I feel like I should use the accounts for something meaningful before closing. About the same DP as DJ. Bonus posted on 11/30 (first statement close after holding $500 for 90 days). No bonus on the personal account yet but there’s still time per the T&C’s.